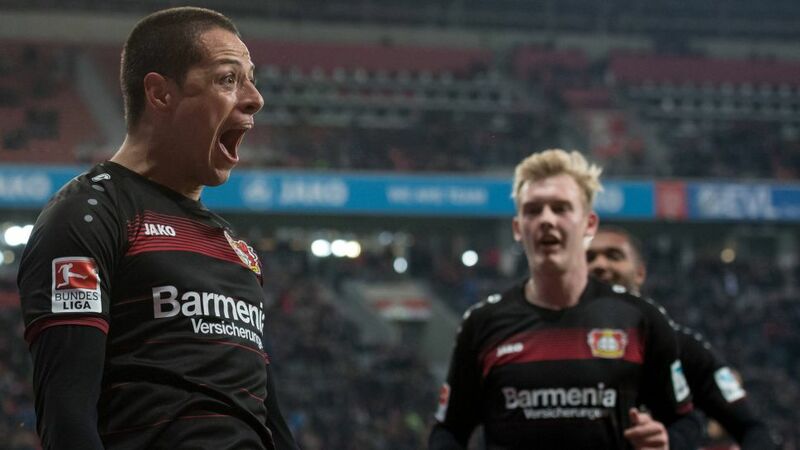 Leverkusen may have tasted defeat, but Javier 'Chicharito' Hernandez (l.) ended his personal goalscoring drought on Matchday 18. Matchday 18 boasted a number of statistical milestones as FC Bayern München and 1. FC Köln broke records, while Javier 'Chicharito' Hernandez ended his barren run in front of goal. FC Ingolstadt 04's Markus Suttner is the only Bundesliga player to have scored directly from three free-kicks this season. Away sides picked up five wins this weekend, the only other time that has happened this season was on Matchday 11. Köln scored six goals in a Bundesliga game for the first time since May 1990 and scored six times on the road for the first time since May 1984. Bayern's Arjen Robben has won all seven of his Bundesliga fixtures against SV Werder Bremen, scoring seven times in the process. RB Leipzig won their seventh home game on the bounce, a longer run than any side has managed to put together this season. SC Freiburg have already won more games (eight) this season than they did when they were relegated in 2014/15 (seven). Bayern have won the last eight competitive games - seven of which were in the Bundesliga. That's the club's best run so far under Carlo Ancelotti. Halil Altintop's goal for FC Augsburg against VfL Wolfsburg means that he has now scored eight goals against the Wolves, more than against any other club. Köln have never lost any of their ten competitive games against SV Darmstadt 98 (W8 D2). Bayern have won their last 13 games against Bremen; that's the longest winning run of any side in Bundesliga history against one opponent. TSG 1899 Hoffenheim suffered a first defeat of the season on Matchday 18, going down 2-1 at Leipzig. Click here to vote for your #BLMVP from Matchday 18! Matchday 18 brought a remarkable 31 goals, the most of any Matchday this season. Bayer 04 Leverkusen's Jonathan Tah scored his first Bundesliga goal in his 60th appearance. Borussia Mönchengladbach came from behind to win after a 1-0 deficit for the 100th time in their Bundesliga history. 'Chicharito' ended a 782-minute goal drought against Gladbach, a run of 11 games.